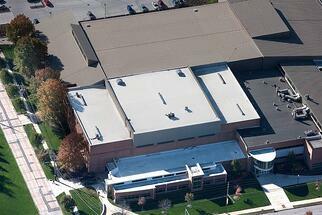 Installed in 1985, the FiberTite roofing system on the Lou Higgins Recreational Center is still standing strong today. Baldwin Wallace selected FiberTite’s 36 mil., the original KEE roofing membrane, to be and adhered to the preexisting deck layer. The 29,000+ sq. ft. project was contracted by Hi-Tech Roofers, Inc. based out of Millersburg, Ohio. Since its installation, the Recreational Center protects not only the students in their daily events, but special events, commencements, community events and dignitaries from governors to congressmen to the President of the United States. In October 2013, the university requested FiberTite XT to be installed on two residence halls, Klein and Saylor, located on Beech Street. The project was completed in October 2013 and is warranted for a standard 20 years, a fraction of time in relation to the longevity of FiberTite roofing systems that have been performing since 1985. “I think we got our money’s worth out of this roof,” Dubena said.